‘Rosa x ‘Nearly Wild’ is an old garden type floribunda hybrid that was bred in 1941 from ‘Dr. W Van Fleet’ x ‘Leuchstern’. These old garden roses have almost disappeared from the landscape and were found again at old abandoned homesteads. There has been a renewed interest in these old garden roses because of their excellent disease resistance, long bloom period, and easy care requirements. They won’t sprawl or sucker like most roses. The long pointed buds open to a 5 petal, single flower that resembles some of the species roses. These 3 inch blooms are bright pink with white centers and yellow stamens, and are surrounded by dark glossy green foliage. They will repeat their bloom all summer, are self-cleaning, and are lightly fragrant. 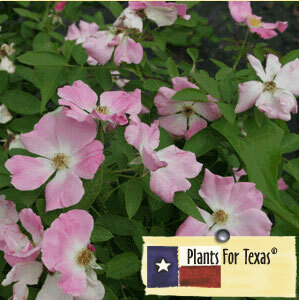 Rosa x ‘Nearly Wild’is part of our Plants For Texas® Program, meaning it was Texas Grown, Tested in Texas to perform outstanding for Texas Gardens.